Price is per 32-inch long strand of these beautiful beads. Each chip is about 5mm to 10mm long. From lightest sky-blue to the deep blue of the sea – aquamarines show all these shades of an exceptionally beautiful range of usually light blues. It is a truly fascinating stone. 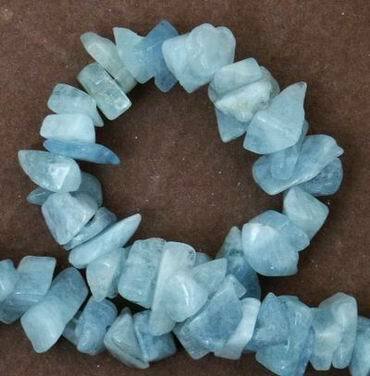 Women all over the world covet it because of its fine blue colour, which suits almost any complexion or eye-colour to perfection, and creative gemstone artists get their inspiration for new cuts more often from aquamarines than from other stones. Its light blue arises feelings such as sympathy, trust, harmony or friendship. These are good feelings, which involve a partner or companion, and prove their vale in long-lasting relationships. Aquamarine blue is a divine and eternal colour, since it is, after all, the colour of the skies. Aquamarine blue, however, is also the colour of water with its life-giving properties. And in fact aquamarine seems to have managed to embody the light blue of the seas. This is not surprising, for according to legend it has its origin in the treasure chest of the legendary mermaids, and has for ages been reputed to be a lucky stone for sailors. Its name has been derived from the Latin terms "aqua” meaning water, and "mare” or sea. Allegedly its powers develop best if the stone is immersed in sun-drenched water. However, it seems a wiser course to carry it, because according to ancient traditions, carrying an aquamarine is supposed to guarantee a happy marriage and to make its owner happy and rich at that – the ideal gemstone, not only for lovers and married couples.